There are many different sorts of shapers in the world; those that shape boards that ‘just work’ and they stick to their models, tweaking them here and there for custom orders, and those that like to experiment a bit and like to evolve their discussions into a classic design. There are those that make cash and have their boards made under licence on a global level, and those that design surfboards from an aestheticly pleasing standpoint but also work functionally. Finally, there are those who like to delve into surfing’s rich and full past, students of the art that dream, that wonder, why a design never ‘took off’, whether it was a victim of ‘surf fashion’ or simply became an inmate of circumstance. It is about one of these latter individuals that I would like to draw your attention. A man who is truly gifted and has the open-mindedness to experiment with new thoughts and the feelings a non conventional shape from the a golden age might bring. This era boasted a freedom of deign that knew little constraint and shaper Josh Dimery enjoys tapping into this colourful time and addressing questions that need to be answered. The man himself in the shaping bay. We have talked to Josh before about his influences and views on surfboard design but we thought this board deserved to be talked about all on its own. I first saw a picture of this board a couple of days ago and have since showed it to many of my surfing friends that are all involved in the industry in one role or another. The responses have been as wide ranged as you could possibly imagine. It’s time to find out more. Josh has agreed to spare some time for a chat about this, in my opinion amazing looking board, that could unlock hidden doors. SB: Hey Josh, cutting to the chase. The ‘Starsky’ looks as different as a surfboard can and stunning, where does the design come from and what drew you to it? Josh: Thank you for the kind words. Honestly it was something I dreamt up while in bed one night. It was almost too good to dwell on until the morning so I doodled the outline down with a pinched V and shaped it the next day. Whilst shaping I remembered making a black fish two weeks before that had a dramatic hull and pinched V slight twin channel. I thought a more defined shape and dropped rails would work well with the turns if I were to have this so called ‘manta’ tail. In my head it would lift it out of the water slightly especially with the keels. 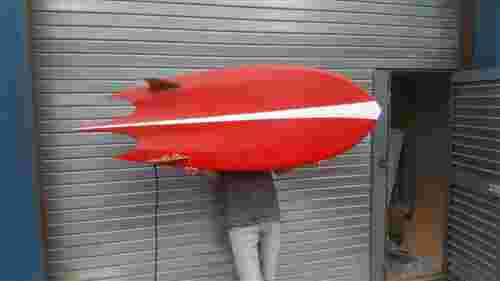 The channels are purely for down the line speed and to help create a finless ride. I wouldn’t say I study shapers or their work, although I do admire retro shapes and the strong fluidity of lines from nose to tail, they almost look curvy with a sharp finish or pulled in tail. I guess I search for ways to make the impossible possible. SB: What waves do you think it will work in? Have you tested it yet? Josh: I have tried in 3-4ft lumpy sets and it got going... there were some cleaner waves coming through and the take off was fast and the turns were big sweeping turns. I think the best days to be seen on it would be 5ft... it loved the late take offs too... just took some minerals to throw myself into it. SB: Was it difficult to shape and then glass? Josh: I think when you have the passion and that desire to see a finished product, difficulty doesn’t play a part. I'd say frustration of things not going to plan would describe it better, having said that, the glassing was far more intricate on the tail. Overall the shaping was good fun, seeing all the contours come to life was worth the sweat... and the glassing wasn’t too bad, although harder than the norm. Starskys car from the Starksy & Hutch TV show and later the Epic film. SB: You mentioned it would work with and without fins which is pretty cool, is that a reality? Josh: I gave it a little go... the waves were dying off which was no fun! so no real feedback for that which saddens me to say! Although I am confident it will go and have you scrambling out the water with a big grin. I made sure the concaved channels are deep enough in correspondence with the defined hull flowing with the rails; so that the board would end up sticking to the wave. Be interesting to see it go in overhead or more..
SB: How much would one set a customer back in £££ and what would the wait time be? SB: I noticed the deep double concave in the hull of the board, how does that work, does it depend on the rails and what does that great big tail add? Josh: So the big double concave was kind of inspired from the black fish I made prior to this. It had a similar set up, just less defined. When thinking about the board I imagined lines... lots of lines and smooth channels. The tail I imagined would act as a fin or at least some kind of traction when firing along the wave and then turning, giving extra stability. It didn't get in the way at all either when paddling or catching waves. SB: Thanks to Josh for his time with the chat and for continuing to push the design envelope and keep us all stoked in the office for the next meanderings of his mind. The Starsky looks like the sort of board we need to try, hopefully we will be swinging by Josh's place to grab it and take it for a spin with no fins. If you are interested in getting one made (and you should be) get in contact with Josh John Dimery here. Once again, the Starsky, yours with or without fins.